The music of Washington D.C. band, Wylder, is no stranger here. However, to say that even after several great releases – single, EP, and full-length – the band is something easy to figure out, would be exaggeration to say the least. Though that kind of less predictable quality may seem like a marker of unfavorable proportions, by contrast, picking up on Wylder’s continually shifting sense of primary musical identity can be, and has been, a pleasantly intriguing experience thus far. Now with the release of new single, “Ready to Break,” the journey keeps moving forward and just as before, has revealed the band tweaking its sound and playing with instrumental subtleties that diverge from previous songs. Saying the foursome has fine tuned its sound on more than one occasion in the multiple years since its formation in 2015 doesn’t mean the band lacks a sense of identifiable, musical vision. What’s important to remember in context of the past, and worth observing in context of the present, is that the stream of changes Wylder makes are never such that the band becomes entirely unrecognizable or are so different that the change feels utterly forced. “Ready to Break” follows the release of two originals and two re-imaginings of songs from 2016 LP, Rain and Laura (independent, 2016), that were all recorded live. Set against the background of this live EP from February, and perhaps even further back to standalone 2017 single, “Save a Way,” the sound of “Ready to Break” comes through like a surprising display of poise that gives off a “just right” vibe between the single’s two release predecessors. Contemplating the two approaches, it’s understandable that Wylder might want to fold in some more dynamic and intense sounds to serve as the propulsion behind hooks or rhythms in new songs. All the same, it’s hard not to be fearful of potential compromise trading away idiosyncratic performance for that deeper instrumental boost. That’s why “Ready to Break” is so promising and exciting. Right from the beginning, the uptempo strumming of an acoustic guitar at the forefront with the immediate following of syncopated, organic hand claps and egg shaker, shows a resurgence of a more folky aesthetic that leaves room to breathe in the mix. Yet, Wylder astutely makes sure to complement this showing of eager but lighter rhythmic energy with the pronounced presence of a hard-hitting, crisply snapping snare on the downbeats of the chorus; a modest modern undercurrent of a single-note but audibly noticeable electric guitar line; and the more pop-rock common polish of heavy vocal reverb and group vocal blending on the titular refrain in particular (“Oh I think I’m ready, Oh I think we’re ready to break”). These decisions feel smart and carefully weighed on their own but even past them, are the decisions affecting dynamic flow and the overall shape of the song. All the increased intensity and tonal substance getting introduced at the first choral break is the ideal place for the song to feel as though it’s both going upward in volume and outward in assortment of and style of musical sounds. Then, when this expansion of sound remains through the second verse, it feels more right and expected because the song worked up to and earned it, as opposed to just loading all the electric and drum-centric bells and whistles from the first loop of the song’s hook. Capping off with a moment of sonic contraction at the bridge – where Will McCarry’s voice returns to being the sole focal point despite keeping the tonal intensity – “Ready to Break” regains a sense of lightness due to the combined reverb and instrumentally open space before finishing strongly with the complete arrangement and multi-part layering. “Ready to Break” might read like a depiction of conflicted writing but it actually plays out much more like a smooth running wave or a metronomic see-saw. The song doesn’t just operate on one style setting the entire way through. Nor does it simply build upward in one, irreversible direction. 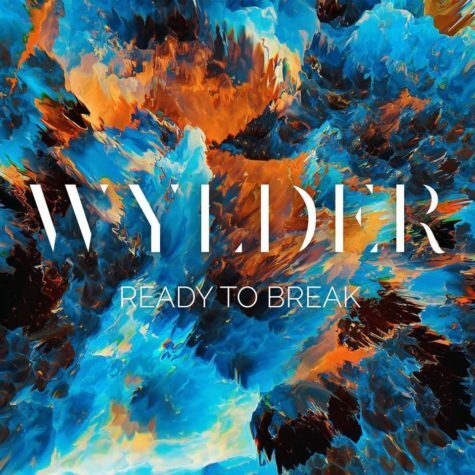 “Ready to Break” is a conscientious blending of individual sounds and overall flow that feels like the best turning point for Wylder yet. The song shows the band has come into its own and can really start navigating the multi-faceted style it has developed over the years, with a comfortable finesse that no longer fights with itself for control. “Ready to Break” is available now. Find it on iTunes and Bandcamp. Streaming is available on Spotify.